This villa’s outdoor area is fit for royalty. Chaise lounges, sun beds, and dining spots abound, so your guests will have more than enough room to spread out and have fun in the sun. Footprints Villa sits on Alleynes Bay Beach on Barbados’ Platinum Coast. Several stories of outdoor living and floor-to-ceiling windows elevate this space to the height of luxury. 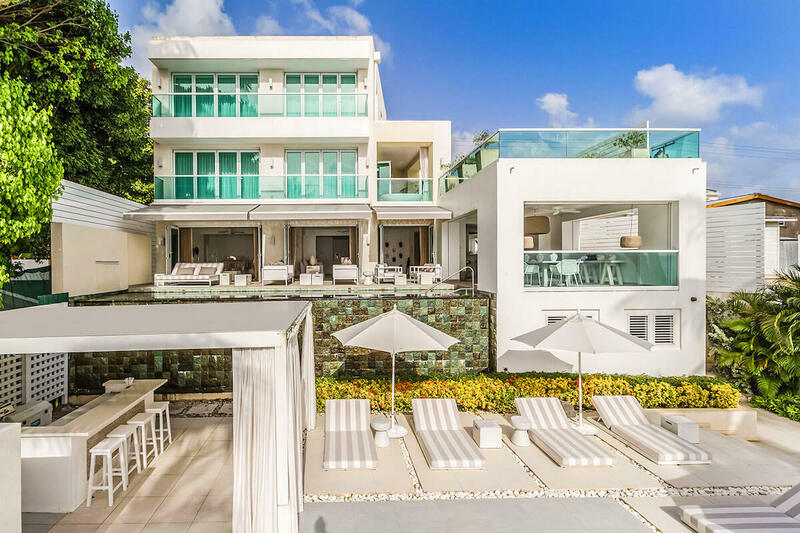 The base level of the villa features various outdoor lounging, dining, and living areas just a few steps from the beach. The kitchenette features a BBQ grill and bar, with shade to keep the temperature cool while grilling. The dining pavilion overlooks the beach, and the lounge area on the terrace is perfect for reading or taking a nap. The infinity pool sits adjacent to the dining pavilion, and is surrounded by chaise lounges, sun beds, and umbrellas. A small lawn separates the pool from the beach. One level up, a balcony with lounge chairs and seating makes the most of the view. The living area on the second level is bright and airy, open to the pool, and illuminated with all-white decor. The flat screen TV is surrounded by comfortable seating, and an additional living area sits on the other side of the space. A small bar is around the corner, just in between the living and dining areas. The fully equipped kitchen features sleek, modern appliances and a small dining table. The basement-level gym is fully equipped with top-of-the-line equipment and a wall of mirrors perfect for checking form. It shares the basement level with a powder room, media room, wine cellar, laundry facilities, and staff area. Each of the five bedrooms has a king-sized bed, air conditioning, and ensuite bath. The master bedroom has its own living area and study, as well as an outdoor, yet private, bath with access to the upper level terrace. The second bedroom has chic white decor, seating, and access to the upper level balcony. The smallest bedroom has a private balcony and desk for studying, journaling, or reading. The two other bedrooms are simple and comfortable. Footprints is a mile away from Reeds Bay and 2 miles from Sandy Lane Beach. Royal Westmoreland Golf Course is just over 2 miles away, and the Sandy Lane Country Club is 3.5 miles away. Of course, Alleynes Bay Beach is right in the villa’s backyard. Footprints was everything we expected and more. The location was exactly as described and the interior was beautiful and spacious. The staff couldn’t have been better - very friendly and always aiming to please. Special mention to Leslie the chef and Sherlund the butler, who were exceptional. Working with WhereToStay was a total pleasure from start to finish. Andrew met our requirements with the choice of villa and organized everything, so that all we had to do was get to Barbados. Very efficient and professional service from start to finish.